SACRAMENTO, Calif. (AP) Dwight Howard lost control of the ball on his way in for an apparent dunk when he was fouled from behind by Zach Randolph. As Howard tried to regain his footing, the ball floated about 3 feet above the rim and then fell straight back down and through. ”I don’t know how it went in,” Howard said with a grin. On a night when Charlotte set season highs in several offensive categories, Howard’s play was symptomatic of just how good things were going for the struggling Hornets. 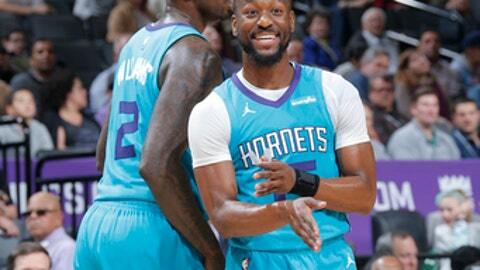 Howard had 20 points and eight rebounds, Kemba Walker added 12 points and 10 assists, and Charlotte built a big early lead in beating the Sacramento Kings 131-111 on Tuesday. Nicolas Batum scored 21 points, Jeremy Lamb added 16, and Michael Kidd-Gilchrist and Marvin Williams had 10 points apiece to help the Hornets to their third consecutive victory in Sacramento. Charlotte came in as one of the NBA’s worst 3-point shooting teams but repeatedly got open looks from beyond the arc, especially in the first half when the Hornets made 10 of their season high-tying 15 3s. Lamb and Batum hit three apiece to pace the outside shooting. Walker added a three-point play and Williams had a 3-pointer as part of another run for Charlotte, and Batum’s short jumper put the Hornets up 72-52. Sacramento made a brief surge in the third to pull to 76-65, but Kidd-Gilchrist scored eight points over the next 2 1/2 minutes to extend Charlotte’s lead to 88-71.